Shake off the blues with Funny Clock 3D Screensaver! 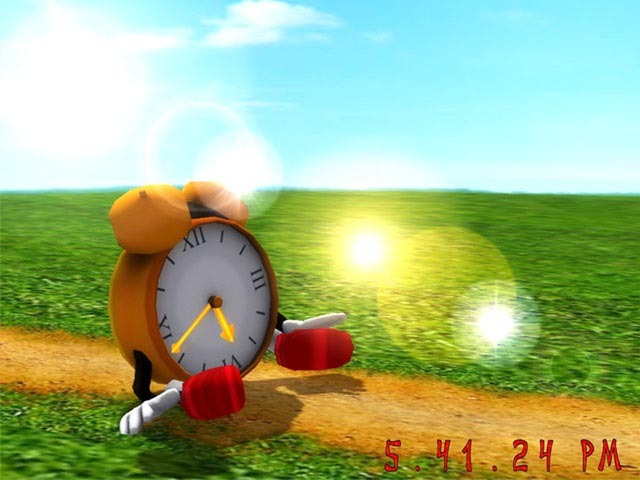 Cheer up with a soft cute clock running along the road, taking short breaks to bask in the warm sun. Escape from the daily routine and plunge into the carefree world with eye-pleasing, emerald greenery, bright rays of joyful sun and dreamy music. Tired of short chilly days, need something to make you smile? Our Funny Clock 3D Screensaver will immediately set you in the right mood! Start Menu 8 - Start Menu 8 is a desktop customized utility for Windows users, specifically designed to bring back the familiar Classic Start Menu to Windows 8/8.1 & Windows 10. MinimizeToTrayTool - MinimizeToTrayTool is a freeware open source utility that allows the user to minimize any application to the windows tray. Eusing Clock - Eusing Clock is a small desktop clock application that will place a great looking, colorful clock on the screen of your computer. You can quickly customize the looks, time format and standard as well as the background opacity level. Wallpaper Slideshow Pro - Wallpaper Slideshow Pro is a great utility for displaying your favorite photos as desktop wallpaper, with lots of different options it offers you complete control on your wallpapers collection. It has support for exif/iptc/xmp and multiple monitors. Freshwater Fish Aquarium Screen Saver - Freshwater Fish Aquarium Screen Saver will bring the fascinating aquarium to your desktop with 3D animated freshwater fishes. Vibrant water plants, varicolored stones and water sounds make the freshwater aquarium more realistic. Quick Timer R2X - Quick Timer R2X is high resolution programmable timer software to control 2-channel relay boards of It's fit for lights control, science experiment, home automation, industry control, energy conservation and so on. Turn Off Monitor - Turn Off Monitor is a Utility by which you can Turn Monitor Off using either a shortcut Key or a shortcut or an Icon in System Tray during music download.Hibernate and Schedule WakeUp and many more features.Register for $5.00 and get Free Upgrades.